A large bull shark thought it was safe to go back in the water. 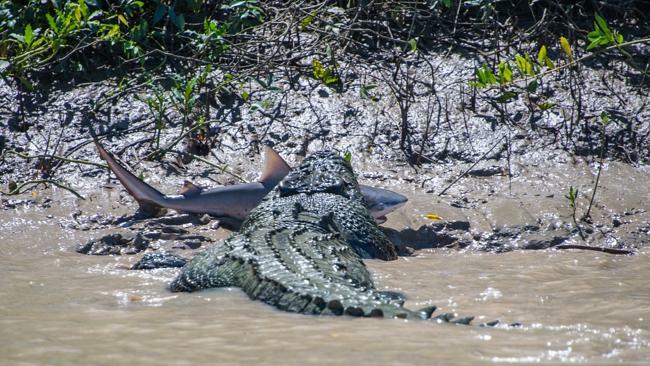 But he didn’t count on Brutus, Adelaide River’s most famous and fearsome resident, who showed the shark who was the true king of the waterway. 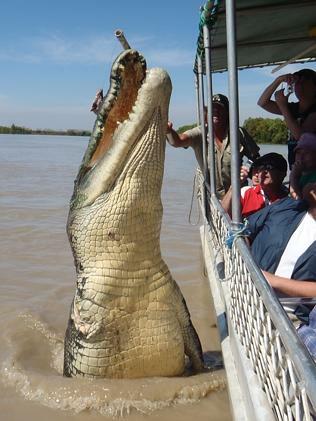 The 5.5-metre croc has become an international sensation, one of the Top End’s biggest tourist drawcards and a frequent star of the NT News. Yesterday, in front of about 25 passengers on the regular 11am cruise, Brutus took his revenge. The moment was captured by Sydneysider Andrew Paice, who is travelling around Australia with his wife Nikki Beaumont and their daughter Madison, 6. It's kinda like the mole on King John's face in the film, Robin Hood...Men in Tights. Keeps going from one side to the other. which pic are you looking at? I had no idea they could grow to that size, what a monster! I wouldn't want to argue with it! I was looking at NT croc Clips yesterday as Brutus is actually only the 3rd biggest, the other 2 are both younger. So Big ones like Brutus will become less uncommon over the years, Brutus is About 80 years old they reckon. On second glance, it's tough to tell just looking straight up the animal's back like that. But if a shark did take the leg, I can see why he is pissed.